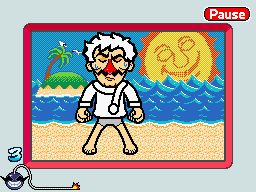 Info "It's getting hot out here..."
Wario is HOT (known as Burning Up in the European version) is one of the Job Center's microgames in WarioWare: D.I.Y. The player has to draw the articles of clothing that Wario wears in the game. The title of the microgame may be a double entendre as Wario is considered to be unattractive in general; the European localization may have removed the double entendre deliberately to remove the suggestive theme. To win the game, the player has to take off Wario's clothes. To do so, they have to tap each one of them. There are three pieces of clothing in total. If the players missed one and the time runs out, they lose the microgame. Wario also wears a wig; if it is removed along with his clothes, he makes a sad expression, although this isn't required to win the microgame and is simply an Easter egg. "I am ROASTING all these clothes! Help me out off'em. But first you gotta figure out what they look like!" The microgame info may be a reference to Nelly's 2002 song "Hot in Herre", specifically its lyrics "It's getting hot in here / so take off all your clothes". The Japanese translation also seems to reference this further. This page was last edited on October 21, 2018, at 00:52.